This week on bethcakes, it’s Smoothie Week! It’s actually just through Wednesday. 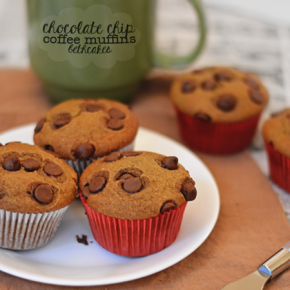 But there are maybe two healthy-ish recipes on this blog and I am going to change that. My problem is that I hate the texture of most fruits and vegetables. I do like the flavor of most fruits though. The only vegetables I really like are the “starchy” ones, like potatoes and corn and mac ‘n’ cheese. Smoothies are a great way for picky eaters like myself to get in their daily dose of healthy stuff. My favorite smoothie of all time is frozen banana, peanut butter, and a little cocoa powder. The thicker and more like ice cream, the better! Strawberries are probably my second favorite thing to put in smoothies (even though I still really hate the seeds). I came across a strawberry cheesecake flavored yogurt at the grocery store when I was buying my weekly amount of vanilla (I know it’s boring! ), and knew I had to make a smoothie with it. 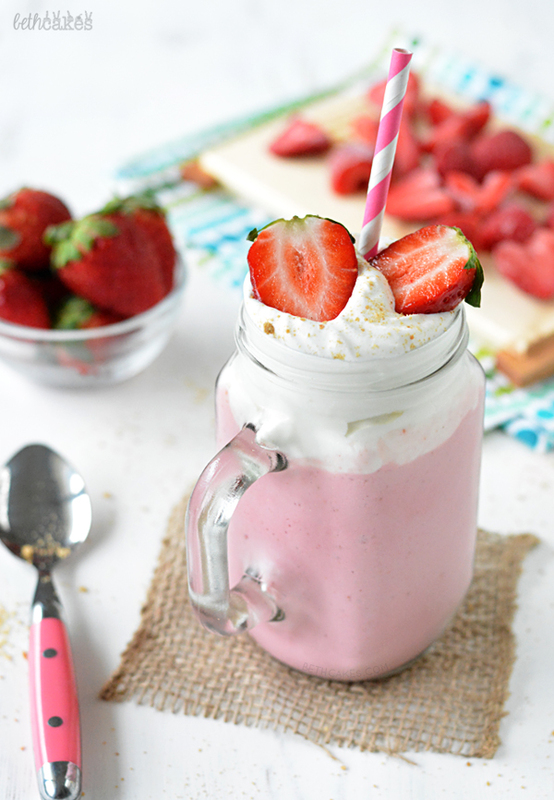 Super simple three-ingredient smoothie full of strawberry cheesecake flavor! Combine all ingredients in a blender. Add the strawberries first, then the milk and yogurt. (I did this the other way around the first time and all the strawberries got stuck together around the blade.) Blend until completely incorporated and smooth. Garnish with a strawberry! Wow, now I have a great excuse to buy a blender! Looks delicious! Yum! Dessert in a cute mason jar, and so much healthier! Hahahahahha, corn, potatoes, and mac n’ cheese! That made me laugh… I’m so with you. I need to start eating better BIG time. Like, it’s ridiculous how much weight I gained the past few months. 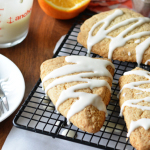 Move over cake… it’s time for Chris to eat healthy. This smoothie sounds amazing! Mac n’ cheese, the best veggie of all time. 🙂 Yes, I need more smoothies in my life and less cake, even though it hurts me a little bit to say that. Haha, thanks Chris! Yaaay for smoothie week! This sounds delicious and so decadent and just what I want for breakfast. Pinned! 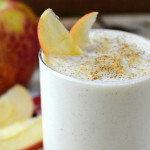 This is a smoothie I would absolutely love and so would my sons! Thanks, Matt! Smoothies that taste like dessert are my kind of smoothies. 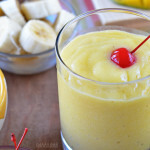 A cheesecake flavored smoothie – that is my kind of smoothie! Yum! I love trying new flavors of smoothies … and I really love strawberries! Yay for smoothie week. I just got a nutria bullet for Xmas. I am ready to rock. This one is MOST appealing!!!!! I saw this on Instagram and my jaw pretty much dropped. This is a gorgeous smoothie Beth! Pretty pink and delicious, just how I like my food. 😉 I’m pinning this to try ASAP! And I can’t wait to see what other smoothies you’re going to share. I’m on the same page re: using smoothies as a way to get my fruits and veggies in. 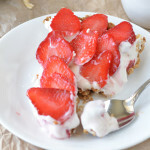 Love this one topped with whipped cream, looks so pretty in your photos Beth! 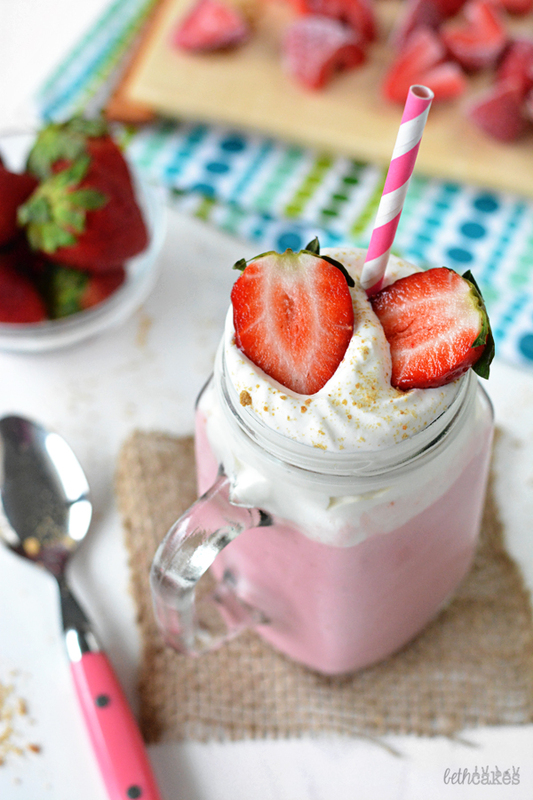 How delicious are these strawberry cheese cake smoothies! I love how little ingredients and how healthy they are too. 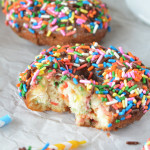 You definitely can consider I will be making the recipe!